Responding to the demands of customers in the oil & gas industry, Crystal Engineering is releasing new pressure modules for the nVision Reference Recorder with ranges of 15k psi, 100 MPa, 1000 bar and 1000 kg/cm². The one year accuracy specification is 0.1% of reading with digital temperature compensation from -20° to 50°C. As with all Crystal products, the new modules come with an ISO 17025, NIST-traceable calibration certificate with test data at 5 temperatures. 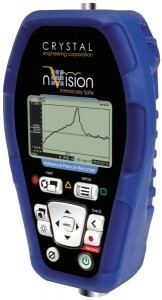 The nVision Reference Recorder, rated Intrinsically Safe and IP-67 (submersible up to 1 meter), has become increasingly popular for applications that require long-term, high-accuracy recording because of its ability to record 500,000 data points of temperature, pressure, current or voltage at 10 readings/second with up to 0.025% of reading accuracy in nearly any environment.